Why can't we use .1 % tretinoin on face? I was wondering this because my doctor had precribed that to me when I had acne and I used it for 6 months ... wondering if I should be worried or not. Re: Why can't we use .1 % tretnol on face? Also is it possible to get vitamin a toxicity through retin-a topical use on the face or other body parts? Re: Why can't we use .1 % tretinoin on face? Do not use Tretinoin when pregnant, planning a pregnancy or while breastfeeding. Otherwise there is no problem. Even if we used it right after dermastamping it should not post a problem? You can use a 0.1% Tretinoin cream on your face if your skin can handle it. No reason for concern. However, lower dosages are still very effective (equally effective, usually) and the more is not always the better with Tretinoin. The higher the percentage, the greater the irritation (redness, dryness). Usually, the initial irritation goes away once the skin gets used to Tretinoin but in some cases it prevails. For scars or stretch marks, I always recommend long needles (1 mm or longer). The frequency of rolling with a 1.5 mm size is every three weeks. So you apply Tretinoin right after microneedling every three weeks. You can also spread out your rolling session and roll for example one cheek (apply Tretinoin), some days later another cheek (apply Tretinoin) etc. The same with stretch marks or surgical scars (needle every three weeks and apply Tretinoin right after). In the meantime, you can apply Tretinoin without dermarolling. I have never recommended rolling every day really extensive areas and applying Tretinoin right after. Rolling three times a week your face with a 0.5 mm roller and applying Tretinoin is OK but the skin may get irritated. Special concerns must be taken during pregnancy and breastfeeding but during those times, special concern must be taken about everything, even about a glass of wine and the best approach is to temporarily quit everything. 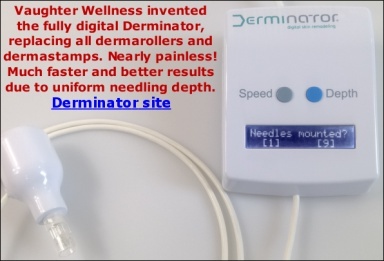 "In case of stubborn, non responsive scars, I recommend needling them and apply the A-Ret immediately after"
"I do not recommend using A-Ret right after dermarolling because it is acidic and it stings when applied to the rolled skin but in some special cases such as stubborn scars and stretch marks, I do recommend it". "If you apply A-Ret right after rolling (recommended with stubborn scars and stretch marks or wrinkles) your skin will get even more red and it will sting. It may stay red for several days." The problem is that significantly many customers have quite some strong reactions after Tretinoin application (redness, dryness) and this reaction will be much more sever if Tretinoin is applied right after microneedling so I have to be careful, recommending it. Your skin seems to take Tretinoin application very well, you are lucky. One has to moisturize a lot when using Tretinoin. For example, wet a cotton pad with tap water, add some almond oil and apply it to your face to offset the dryness triggered by Tretinoin.